01:39 – Birthday present opening. 02:20 — Doctor Who: New companion announced. 08:54 — The Punisher: New Netflix series. 12:13 — Superman: Krypton prequel TV series. 15:54 — Barry Howard: DEAD! 16:45 — Dredd: Karl Urban wants a Netflix series. 18:46 — Doctor Who: Target book covers exhibition. 19:24 — Shakespeare Live: Coming to US ‘movie theaters’. 21:31 — Doctor Who RPG: Siluarian source book out now. 23:02 – Doctor Who: The Diary of River Song, Series 1. 37:43 – Game: Things in Five Words. 43:30 – Indiana Jones and the Last Crusade (1984 film). 68:08 – Farewell for this podcast! 68:32 — End theme, disclaimer, copyright, etc. Cartoon Museum: Doctor Who: The Target Book Artwork. BBC: Shakespeare Live! From the RSC. Cubicle 7 (Makers of the Doctor Who: The Roleplaying Game). 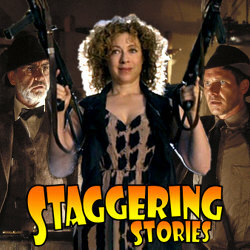 The Diary of River Song, Series 1. TARDIS Data Core: The Diary of River Song. Wikipedia: Indiana Jones and the Last Crusade.